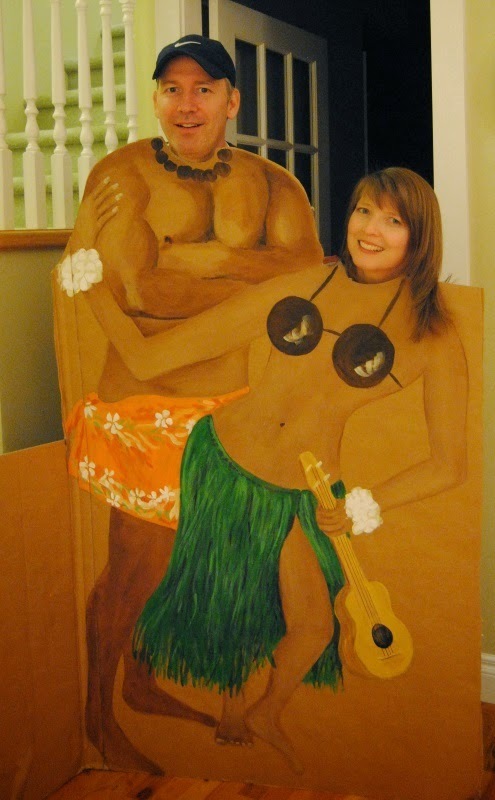 A fun theme party for any age is a Hawaiian party. You can have a luau at any time of the year though it is easier when you can have it outside. Sometimes having a luau in the winter helps warm everyone up and makes for a refreshing change from the cold. It is fun to have your guests dress up for the occasion. Suggest they come in tropical clothes if they have them. Greet your guests with a lei and a big Aloha. 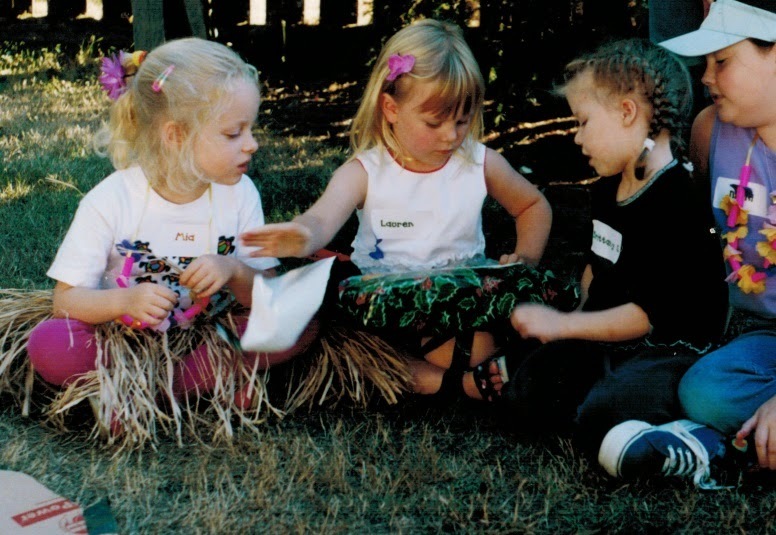 Hawaiian type activities for all ages include learning the hula, the limbo, hula hoop contests and silly photo booths. Check out a video from the library about hula dancing, hire a professional dancer or just turn on Hawaiian music and encourage everyone to dance. Give your guests grass skirts made out of raffia, streamers, garbage bags, or ribbon. 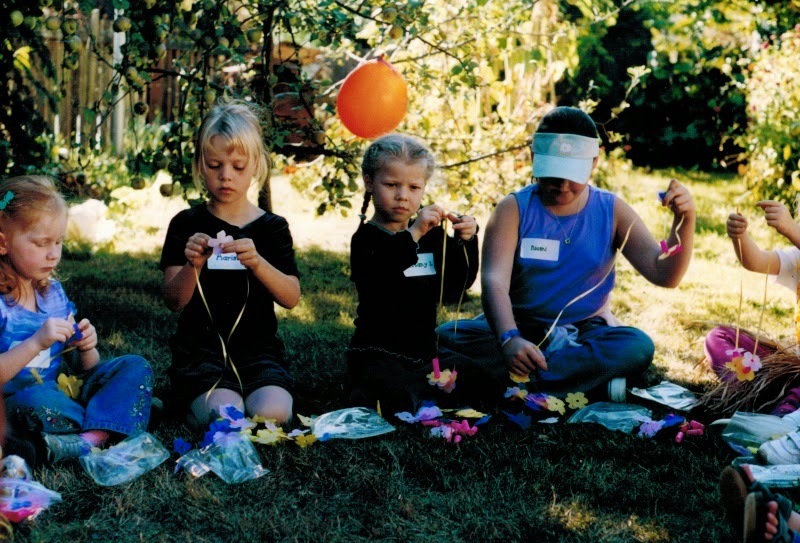 Younger kids will enjoy making their own leis out of dried pasta (you can color pasta with food coloring), beads, cut straws, card stock flowers, tissue paper flowers, plastic flowers, fruit loops, or shells. 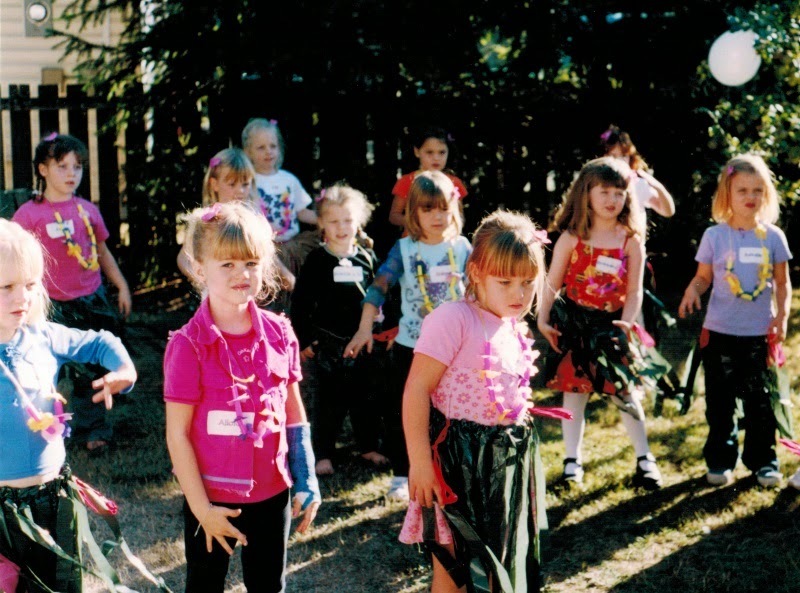 Dress up in the leis and skirts for your dancing lesson. 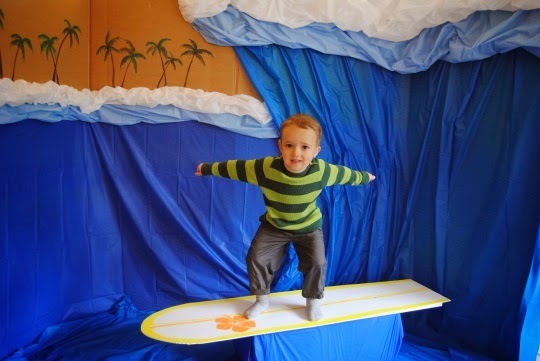 For a photo booth you can paint Hawaiian characters on refrigerator boxes, or make a surfboard out of cardboard or corrugated plastic and place it on top of a solid block of wood or a stepping stool or use an old ironing board with a blue sheet, tarp, or plastic table cloths under and behind to look like your guests are in the water. Pack the suitcase relay -- have a couple of different suitcases and equal amounts of clothes and accessories that would be good for a trip to Hawaii like shorts, tee shirts, swimming suits, sun glasses, hats, flip flops, etc. Make as many teams as you have suitcases. Have the teams line up at one side of the room with the pile of clothes and accessories. Put the empty suitcases at the other side of the room. When you say "Go!" the first person on each team puts on all of the clothes and races to the suitcase, opens them up, takes off all the travel clothes and puts them in the suitcase and then rushes the suitcase back to the next player. The player who is next in line has to dump the clothes out and put them on and carry the empty suitcase across the room and then take back off all of the travel clothes and put them in the suitcase and bring the full suitcase back to the next person, and so it goes until every player on the team has had a chance to try on the clothes and pack the suitcase. The first team to have everyone complete the task is the winner. Pin a coconut on the palm tree -- similar to pin the tail on the donkey. Coconut relays -- divide the guests into teams and have them walk with a coconut between their legs or elbows, pass it to each other behind their backs, or rolling it on the floor. Musical beach towels or surf boards -- play like musical chairs where you walk around the towels or surfboards (cardboard or poster board cut and painted like surfboards) until the music stops and then everyone has to jump on a towel or surfboard. You could also have everyone pretend to surf with the music on and when the music stops they have to jump off and change surfboards when the music starts again. While the music is off you can quickly take one surfboard away. Pineapple bowling -- Put a little bit of water on the bottom of 2 liter bottles and wrap in yellow paper or cover with yellow tissue paper to look like pineapples. Use coconuts as bowling balls. Tidal Wave -- take a very large blanket and place it on the ground. Give everyone a mini beach ball with their name on it and place it in the center of the blanket. Then have everyone grab part of the blanket and call out "tidal wave" tossing the blanket until there is just one ball left and that is winner. Shake Your Bootie -- Cut two slots in the back of empty tissue boxes for a belt to fit through (belt, scarf, ribbon or rope). Fill the tissue boxes with ping pong balls. Tie the tissue boxes around your guests waists making sure the tissue boxes are at the back. Put on some lively Hawaiian music and let the players shake their booties to the music to get rid of all the balls in the box. The guests can't touch the box with their hands or get help from others. The object of the game is to be the first to boogie all your balls out! Funny Hot Potatoe -- Load a garbage bag with all sorts of embarrassing and somewhat funny Hawaiian clothes and accessories (bikinis, big briefs, etc.) Now in the form of hot potato you pass the garbage bag around and when the music stops, the person with the bag pulls out an article of clothing and must wear it! The game ends when all the clothes are gone. The winner is the person with the least clothes from the bag on. This game is good for a laugh, especially when guys are wearing bikinis and so on. Wear the garments over your own clothes.